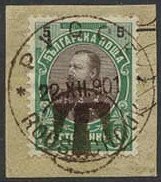 According to official sources like Michel, the post office of Russe (Roustchouk/PYCCE) made provisional postage due stamps 22-25 December 1901 by overprinting regular Ferdinand stamps (Mi #53-58) with a black "T" in a circle due to a temporary lack of postage due stamps. 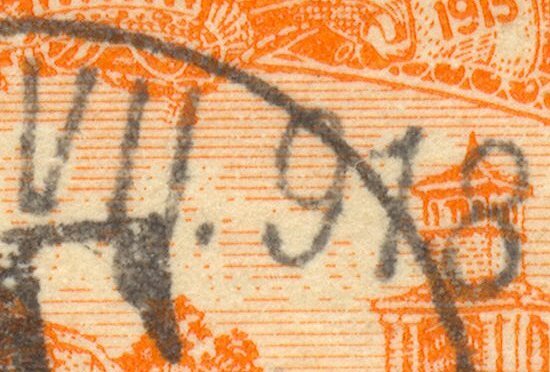 Original issues of these overprints are extremely rare and expensive, and this has naturally attracted a number of less than honest individuals... 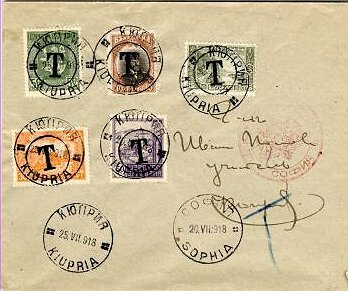 Most "T" overprints on the market are copies made at a later time, including the samples shown here. Not all Bulgarian philatelists accept these stamps as genuine. 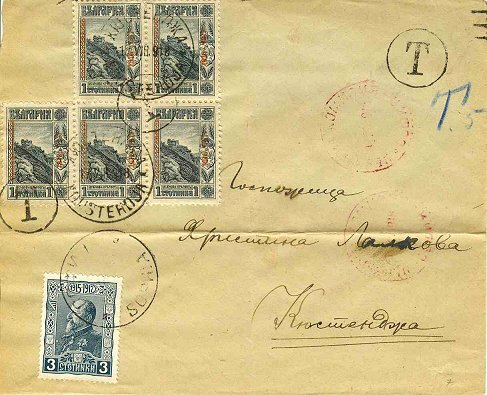 They first appeared in offers from Alexander Richter, a famous dealer in Russe at that time, and some of the original issues carries his signature on the back. Some believe Richter made these overprints himself. Few have ever seen these overprints on a genuine cover - they mostly appear on cut paper only. However, covers DO exist, as these samples from an old auction catalog show! 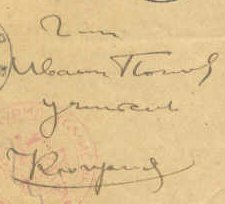 Note the different shape of the "T" cachet to the right of the envelope (applied at the sending or a transit post office? 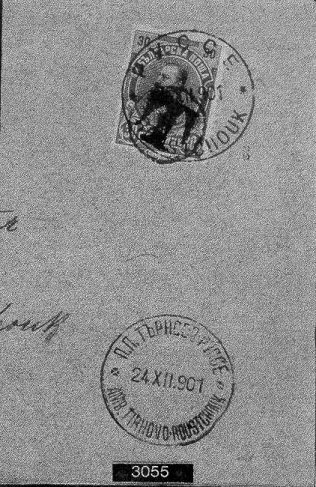 ), compared to the two printed on the stamps. 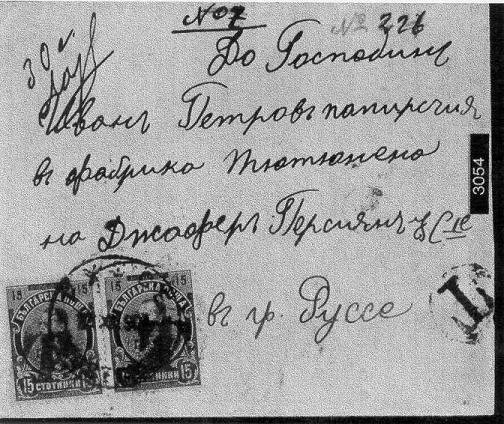 There also seems to be a cancel under the stamps, probably from the sending post office. 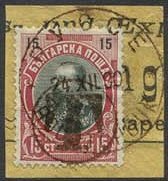 I have been looking at your website on Stamps and History of Bulgaria and as a collector of that country for nearly thirty years I find it very interesting and informative. I see that you too are interested in the T overprints applied at Kiupria in WW1. 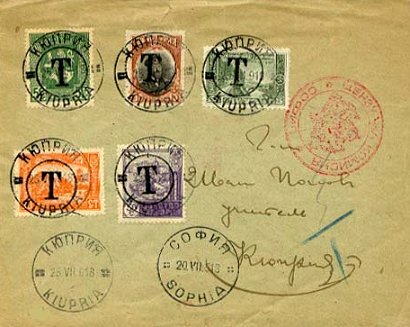 A knowledgeable American collector once told me that these arose as follows: From 1915 to 1918 Kiupria was of course occupied by the Bulgarians and the Bulgarian official sent there to serve as postmaster created these overprints in order to supplement his income. They are certainly nothing more than interesting fakes. The following sample shows a fake Kiupria "T" cover I purchased as study item from a well respected dealer who (hopefully) had no idea about the true state of the cover. 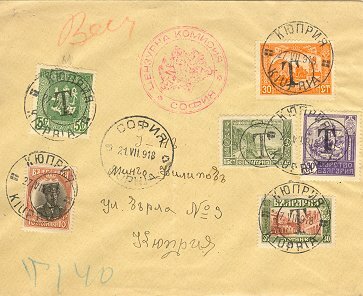 It appears to be sent from Sofia 21.VII.1918 with Sofia censor cachets on the front and back of the cover, to arrive in Kiupria 27.VII.1918 where 6 different "T" overprinted stamps totalling 140 Stotinki postal rate are attached and cancelled. There are no receiving cancels on the back of the cover. Note how neatly the stamps are placed on the cover! 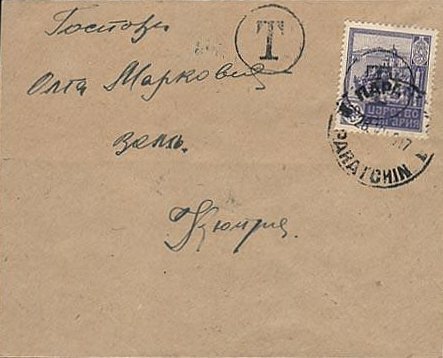 It is highly unlikely that an unfranked cover would be cancelled in Sofia on the only place where there are no stamps attached. Furthermore, why would a postal clerk use 6(!) different stamps, all neatly spaced and cancelled just to pay the postage due fee? A really big enlargement shows that the "T" cachet on this cover is struck OVER the date cancel. 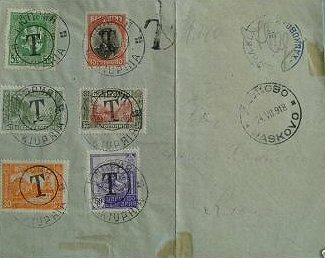 Thus, the "T" is applied after the stamps were attached to the cover. The next two covers are almost identical. 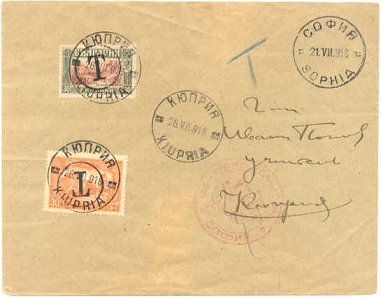 They are supposed to be sent to Kiupria from Sofia 20.VII.1918, they have the same neatly placed stamps (110 St), the same cancels and identical handwriting. Even the blue "T" pencil marks are placed in identical positions! Again one might ask why a postal clerk would use so many different stamps, all neatly spaced and cancelled just to pay the postage due fee? 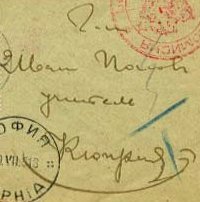 The following cover sent from Sofia 25.VII.1918 has an address written with latin characters, but again we find the same stamps and cancels. This time, the postage due fee is 140 St. This cover or wrapper is a little different, though. 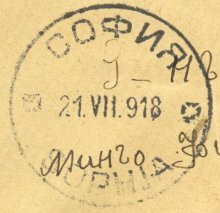 It seems to be sent from Haskovo 24.VII.1918 with a second blue censor or village cancel. The address on the envelope is illegible. Still, it is the same 6 "T" overprints of 140 St, and the same Kiupria cancel. over-optimistic dealer prices the item like a genuine and rare "T" cover!! 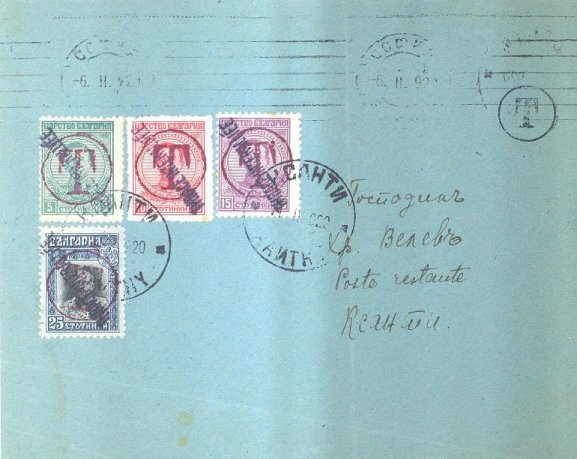 This seems to be a nice but philatelic 1913 Sofia cover with the Balkan war issues. 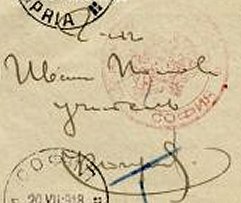 Note, however, that even though the Sofia cancel seems to be different, the handwriting on the cover is the same as on the Kiupria samples above. I have no doubt this is a complete fake with the same origin as the Kiupria "T" covers above. This cover has never been mailed! Recently, a set of new Kiupria covers has been brought to my attention. This sample is cancelled in Kiupria 26.XII.1917 (as opposed to 1918 for the samples above). 10 St is correct local postage rate, but not for a penalized postage due cover? The "T" cachet is obviously struck on the stamp BEFORE it was attached to the envelope. Also visible on the left side of the stamp is part of a "T" cachet for the next stamp in the sheet. 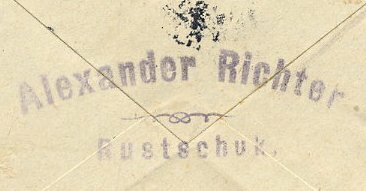 It is difficult to tell from the scan alone if the "T" cachets on the stamp and on the envelope are the same or two different once. Any information or opinoins about this cover are most welcome! This cover was offered to me as an "original Kiupria cover" with a price of 550 Euros(!!). 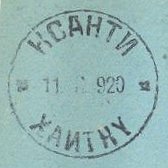 It is cancelled 12.VII.1918 at the "3rd Military Exchange Mail Station" (Macedonia), and at Kiupria 25.VII.1918. 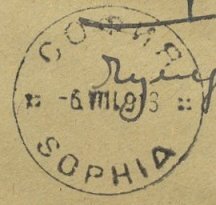 The censor cachet may be from Sofia. 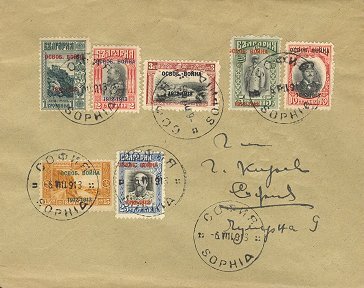 As opposed to the samples above, this cover has a block of 4 stamps overprinted with a single "T" cachet. To the right on the envelope, there is also a second "T" cachet. In my opinion, the cover is "too good to be true", but if you have other opinions they are welcome! Furthermore, here are a couple of "T" covers offered on eBay by a German seller. 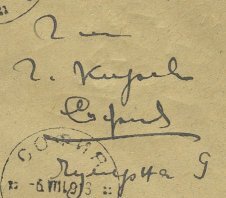 The first is again from Kiupria 26.XII.1917, with the unlikely postage due rate of 5 St. Note also the characteristic arc drawn under "Kiupria" which can be found on several of the covers above. In my opinion, this cover has never travelled in the mail! 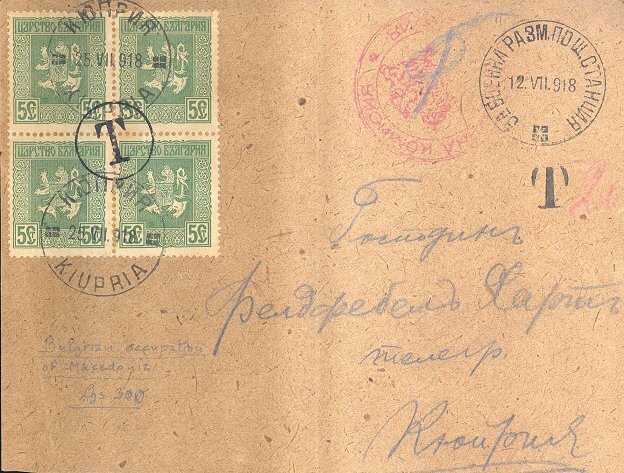 This second cover, on the other hand, is to Kiupria from the town of Paratchin 26.XII.1917(?). 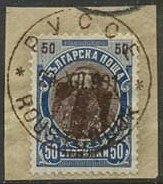 This time a postage due rate of 50 St is used. A different cancel, but this cover is most probably just as fake as the others shown here! 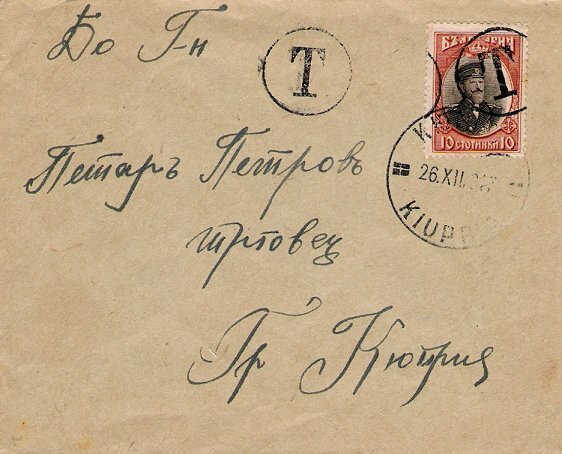 This sample is sent from Sofia to Xanthy in Thrace in 1920. It is worth noting that there are two different "T" cachets used on the cover, and the Sofia machine cancel is an unlikely item to fake. Further information or opinions are welcome! This is also a little "mystery" from my collection. 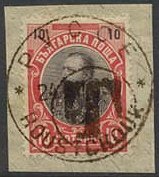 It is an Occupation of Romania issue with a "T" overprint. 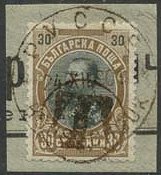 The cancel on the stamp might be "Sofia". Most likely it is just another fake. Does anybody have any idea about this issue? Its Kustendja. 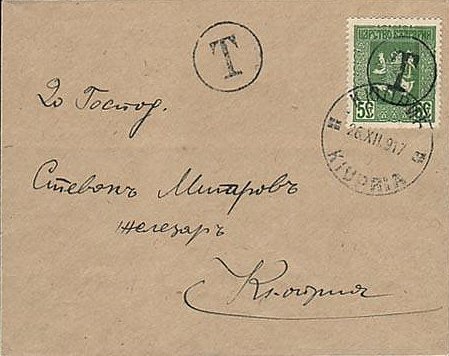 Attached is a jpeg of an underpaid cover from Sofia to Kustendja (occupied Dobrudja) that has been censored in Sofia, sealed by the censor (no label, therefore posted unsealed) and the postage due computed as 5 st. Five 1 st stamps with the occupation overprint have been added and handstamped with two T in circle marks, one of which ties the block to the cover. Could be philatelic, but looks properly transmitted. 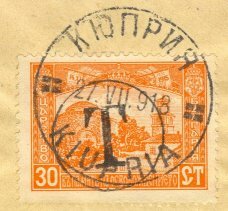 I also have a block of four, each with T in a circle, postmarked Kustendja by favour, but then there was a lot of 'by favour' cancelling going on even in wartime.. 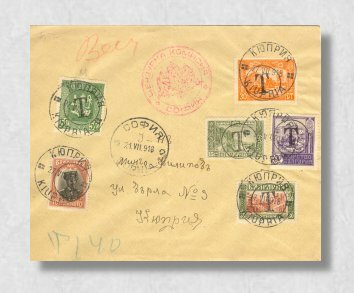 I also have a nice Western Thrace T-handstamp on genuinely run cover and a 1930s cover from the UK with T-handstamp PD charged. I think they did this whenever an office ran out of PD stamps. 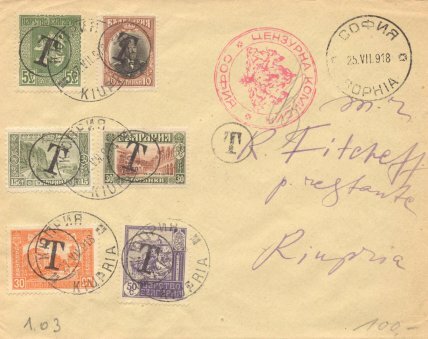 Also have two Ferdinand 1901 issues with red T handstamp, not Rustchuk. H. Pedersen/Denmark, N. Penev/Bulgaria, T. Hitzler/Germany, E. Vlassis/Bulgaria, R. Morrell/UK and M. Whittaker/UK.